David Carter: “As Minister of Agriculture I would sell Landcorp. I don’t see taxpayer money best invested in farms” (10 March, 2008). He need not be defensive. Mr Key is already on record saying Landcorp farms would be sold. Indeed National leader John Key told Rural News last year that he has concerns that Landcorp is not performing. Mr English confirmed last year that National will have a programme of the partial sell off of assets. So was Mr Carter really misquoted? Or has he adopted his leader’s habit of saying what people wanted to hear? Some may say “but Labour has sold farms too”. But there’s a difference between the odd sale (and purchase) in the pursuit of operational efficiency when you’re committed to overall ownership of the asset and a wholesale sell off. Just to re-inforce the point, the Government took steps last year to place strict criteria around future sales. He was talking about Australian landcorp. or perhaps just light-hearted in his comment? “I think the environment’s changed now, where people can see the Government’s got the New Zealand Super Fund there, they know it would be good to have more savings, and they want to save more,” he said. The partial selldown of an SOE could be done in a variety of ways, such as something like 25 per cent of one being floated on the local stock exchange. 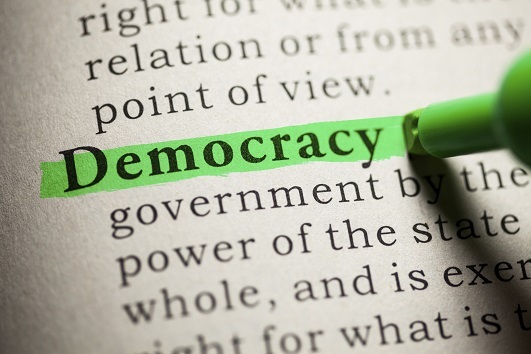 Local mums and dads could be given an opportunity to buy shares, while the Government would – as long as it sold less than 50 per cent of the company – retain control. Local mums and dads already own the SOEs. i think he meant “local mums and dads who can afford a share portfolio”. still, a National party that’s bereft of ANY new ideas and still wanting to sell public assetts huh? who would’ve thought it. no wonder they don’t want to talk about their policies. i think he meant “local mums and dads who can afford a share portfolio’. Yeah, I figured the mums and dads who struggle by on $11.25 an hour doing double shifts to feed their kids weren’t the kind he had in mind. no. apparently they don’t deserve any public benefits, that would only encourage them. Socialist paradise? Far from it Steveo, there’s still plenty to do. But if we’re talking minimum wage then I’d rather have a Labour government than a National one any day. Under nine years of National the minimum wage fell in real terms. Labour has increased it every year. Think about that for a second, if the last National government was still in power these people wouldn’t even be on $11.25 – they’d be lucky to be earning $7 an hour. That used to annoy the hell out of me when they started selling shares in Air NZ. “Your chance to own your country’s airline,” said the ads. “I already own it, you fucks! Stop trying to rip me off!” Eventually, the drugs kicked in and I realised shouting at the TV was futile. Voting against political parties who want to sell my stuff is however, not futile. So, should the Govt even be owning farms in the first place? Of course they should be owning the farm. Landcorp is an assett owned by all for the benefit of all. Who gave National the right to sell off our farms. Labour should really be using the surplus to purchase further assetts for this country for the benefit of all. As property prices come down now is the perfect time for landcorp to increase their size and for the government to take a greater control in our primary industry. Labour….this can only be a vote winner. LAndcorp is a property speculation company. It is buying and selling farms all the time. Landcorp makes minor changes in its portfolio for various reasons all the time, as do other SOEs, but it is not selling down its’ holdings overall. Landcorp has been selling off land as part of overall govt policy for a number of years. This mainly involved and still does involve selling to lease holders. This is so it can focus on a smaller amount of physical assets while reducing all the costs from having larger land holdings. The idea is to then make those remaining assets perform well under direct management from Landcorp. 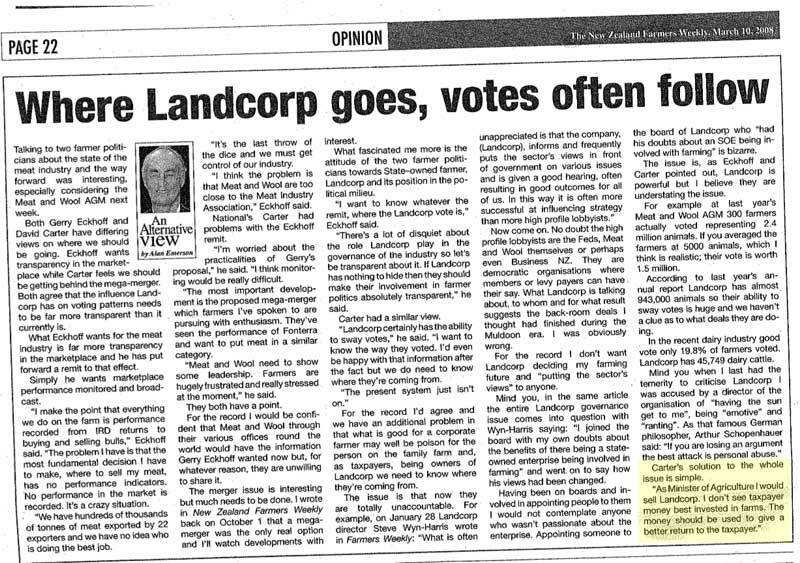 Landcorp does make a return to the Crown but those profits reflect the income instability in the farming sector itself. I’d also like to ask those who favor state farm ownership, would you as taxpayer owners who profess to be concerned about the environment be prepared to accept Landcorp increasing its dairy conversions to maximize returns? Due to very bad performance for sheep farming Landcorp has been doing this. How do you feel as an â€˜owner’ about that? It’s funny, you think National would have learned by now to read their interviews afterwards for mistakes. They can hardly blame other people for misquoting them if they’re going to let these mistakes sit around all the time 😛 Maybe they should start asking for transcripts before publication. Landcorp farms present an excellent opportunity for the Government to demonstrate how organic management could solve a number of pressing issues – carbon sequestration, water quality, food safety, soil security and so on. What a beacon they could be on the world stage and how easily this could be achieved. how quaintly naive. You don;t expect the government to be bound by the rules they expect the rest of us to follow, surely?